We are often asked about cool calendar-related things we might recommend. 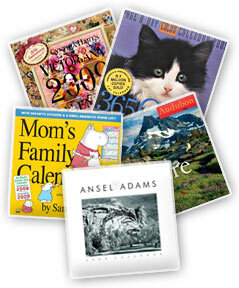 The following items relate to calendars and our solar system. Items purchased through these links, as well as through the recommended books, help support WebExhibits. Calendars can be more than utilitarian; they’re a fun way to express your interests or personality while still keeping track of the days. Whether for yourself or as a gift for a friend, family member, or coworker, the perfect calendar will bring a smile to your face every day of the year – and support WebExhibits in the process. In an age where Google Earth and MapQuest make it seem as though the earth’s landmasses and oceans are a click away, traditional globes may seem quaint. Yet spinning a globe fuels flights of imagination, conjures up memories, and provides a very real perspective on the size and relative positioning of countries, continents, and oceans. 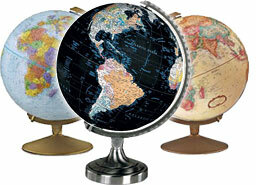 Replogle Globes, the country’s premiere globe manufacturer, offers three superb globes that enchant and delight: The Explorer Globe; the classic World Globe with an antique finish; and the Orion Illuminated Globe that lights up when touched and features a black ocean. Since the dawn of humankind, we have had a fascination with our celestial neighbor. With NASA’s current focus on returning to the moon and building a sustainable, long-term human presence there, Replogle’s NASA Moon Globe is a must-have for anyone who follows lunar exploration. For eons, calendars have been based on the positions of the sun and the moon, and seafarers have relied upon celestial navigation to find their way. Celestron’s SkyScout Personal Planetarium uses 21st century technology to keep your head firmly in the heavens. Simply point the device toward a star, and the internal GPS system will identify what you’re seeing. Or, enter the name of a star or planet, and let the GPS guide you to its position in the sky. Plus, the built-in field guide provides you with comprehensive information on over 6,00 stars, planets, and constellations. Whether you want to introduce your kids to the night sky or are looking for a portable telescope to take along on camping trips, this Orion StarBlast 4.5 Astro Telescope provides the perfect means for panning across fields of stars like the Milky Way, the Pleiades, and the Andromeda. Its compact design and superior optics are matched by its intuitive operation. Whether you want to add a festive accent to parties, create mood lighting for any room in your home, or have a reliable standby in the event of a power outage, this Oxo Candela Glow is the answer. 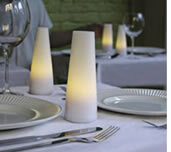 It glows like a candle but is powered by innovative, rechargeable LEDs that provide light for eight hours. In the classroom or at home, this Learning Resources Calendar and Weather Pocket Chart is a great way to teach kids how our calendar is organized. With pre-printed cards for dates, days of the week, months, years, holidays, weather conditions, and seasons, children will delight in learning all about the calendar. Perfect for your child’s bedroom or the family room, the Melissa & Doug Deluxe Magnetic Calendar features 136 magnets depicting the days of the month, months, years, activities, and holidays. All in all, a fun and lively way to teach children about the calendar. It’s never too early to explore the heavens, and this Learning Resources Inflatable Solar System Set makes exploration fun. With a 36” sun and proportionally sized planets, you can replicate our very own solar system in the classroom, in a playroom, or in your child’s bedroom. With this 3-D Solar System, the cosmos becomes a microcosm to enchant your child. Glow in the dark planets, over 200 adhesive stars, and a solar system guide will bring the universe to life and captivate your child’s imagination.